This is the chair I did. I chose to wallpaper it with paper from the entrance hall at, My Old Historic House.I felt it would represent the museum best that way. The 1845 Historic Elgin/Cottrell House Museum, aka, My Old Historic House. My blog, My Old Historic House, is all about my home, the 1845 Historic Elgin/Cottrell House Museum. It is an adventure that I have been on since 2006. I started the blog adventure late 2010. Mostly it is about the old historic house,but often I include home town events and shopping experience. Today's blog is a Home Town Event. I live in Clarksville,Mo.It is a small historic town on the banks of the Mississippi River. We have 490 citizens, give or take. It is a tight knit community where every body knows your name. A few years back a couple of of more concerned and energetic citizens worked hard to re- build most of our historic riverfront buildings. Part of there plan was to encourage artist to come live and work here in Clarksville. It worked and today we have a strong group of artist who make Clarksville there home and they all have studios and shops in the historic buildings. The artist work hard and have formed a guild to help promote the Arts and Clarksville. One event they have twice a year is, "50 Miles Of Art." You see there are 3 towns on this river that all have a strong art population. Clarksville, Louisiana and Hannibal. There is 50 miles between the three towns. So this celebration of art was born. This weekend is the Spring Art Studio Tour. All the shop owners have worked hard to do window displays, re- stock,put on demos and send out notices. Along with the event this year, the artist have come up with a special art project. I have dubbed it, "The Art Chair Project".We have a new artist, of which we are very proud. She and her husband have bought a church here in town. The membership was off, and the church had closed. We were all concerned about the building. But, it is in good hands now. Mary, the new artist, had a brainstorm of an art ideal. In the church was a group of chairs. She gave one to each artist and asked them to paint, decorate or create a design that represented there studio. I was luckily included. I wallpapered my chair, with paper from the Elgin/Cottrell House. The chairs are all on display this weekend in front of each shop or studio. The chairs are offered for sale, and the money will go toward advertisement. We had a beautiful day yesterday. The sun was shining and there was a gentle breeze. People came from far and near to view the art. People were happily surprised to seek out the chairs all about of town. This chair was hand painted and beaded by our own DiAnne. She is a Drum Painter by trade. This chair was designed after a Native American Rug weaving. Love the beads. This chair was by our ceramic artist. It has hand made ceramic decorations. This is for Clarksville Sun Flower Days. made by Trish at Clarksville Glass Works. The chairs are of many media and designs. Some were embellished with hand made ceramic ornaments. Others had had beading. One was wrapped with wild grape vines and decorated with Sun Flowers. You see, the Art Guild also has a sun flower festival.One chair had a skirt, mine was wallpapered,one was painted with a Eagle. ( Clarksville has Eagle Days in January, where people come to watch the nations bird fish in the Mississippi. )One chair was purple and had a child's theme and came with small decorative note books. All in all the chairs were a special delight and a big hit to the Studio Tour. This one from Cool Beans Coffee Shop. I am sharing the chairs with you all today. I only wish you could be here in person to see the town, studios, shops and tour, My Old Historic House. The house was open yesterday and many people came and had a tour. We are at it again today. I hope we have lots and lots of tourist and people buy all the chairs. I know there are people with they eyes on several. Come soon and have a visit. We will all leave the lights on. Almost every studio or shop has a dog. So like Sissy Dog, they will all meet you with a jump and a kiss. In the mean time, Support The Arts. With out them, life could be rather beige. DiAnne made two chairs for her gallery, Earth's Heart Beat. Old Yellow looking out. Caron from the Windsor Chair Shop. Is a Blog about the 1845 Elgin/Cottrell House Museum in Clarksville,Mo. I am the owner, writer and curator. My name is Richard Cottrell. 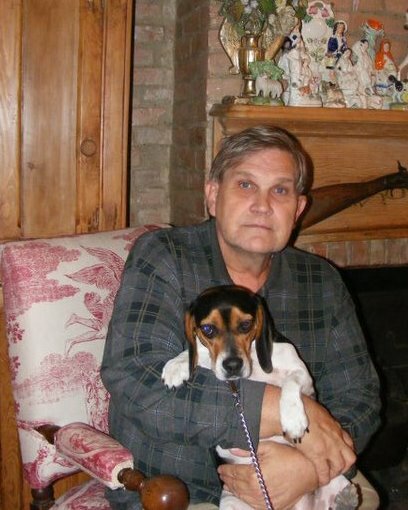 I live in the old mansion along with my faithful dog, Sissy the Beagle. I purchased the house in 2006 and spent the last 6 years restoring it to it's original splendor. The house has been featured in many magazines, such as Victorian Homes, newspapers and TV stations. I offer tours of the entire house with a reservation. I ask they you call at least one day in advance and have a least two people. I do charge for the tours, the fee helps me maintain the property. 573 242 9688. or email. www.cottrellprissy@aol.com. The old house was built in 1845 with a 1860 addition. It was built on land that was given to Samuel Elgin from President Manroe. Mr. Elgin's son, Hazakeiah, built the house. The bricks were hand made on the spot,by slaves. Because I am only the 4th owner, the house has stayed mostly in tack.I have used reproduction materials that represent the time period of 1860. The house very much reflects the American Ante Bellum period of history. ( before the civil war.) The houses has a vast collection of antique furniture, accessories and portraits of that period. Call soon to make your appointment to come and visit Sissy and me. where I personally guide the tours. Today the blog is about a Lady in Red. She is one of my many ,"store bought relatives." my family never had money to have portraits painted, so when I started making some money, I bought me some relatives. I have named this lady, my rich cousin Julia. I call her rich because of her velvet dress with fancy lace trim and her gold, ruby and diamond jewelry. I had a lady friend named Julia. She was from a very well to do family, that's where I got this ladies name. Who she really is? I have no ideal. This painting is done with oil on canvas. Her cloths, jewels, hairstyle and background, all indicate that she was painted around 1850-1880.She is beautifully done, especially the velvet of her dress and the lace. She has a beautiful, kind and sweet face. When she sat for this portrait she wore all her jewelry, and it is very fine and beautiful.She must have been a real lady of means. Julia hangs in the Up River or Ladies parlor at the Elgin/ Cottrell House. She always gets lots of attention, as do all the other portraits.That is why I made up the story about, store bought relative. People always chuckle when I say that and it seems to make them happy, as I have no real ideal who she really is. I wish you would consider coming for a tour. I will leave the lights on and Sissy Dog will always meet you with a jump and a kiss. If you can't come today, maybe soon. You all are always welcome.